We take road safety very seriously, so when we developed the system we adopted and pioneered up-to-date best-practice to ensure that if you want to travel seated in your powerchair you are as safe as you can be. It is almost always safer to travel in a dedicated car seat; its primary purpose is to keep you safe in the event of an accident whereas a powerchair also has to be a powerchair. But there can be other risks, for you and the people who help you, from regularly transferring between your Dragon or SnapDragon and a car, so it may be that the best option is to use the crash-tested docking system we have developed. The docking system meets ISO10542-5 (the standard which applies!) 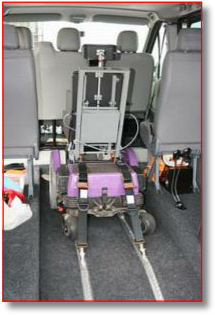 and, since the seatbelt is integrated, there is no risk of fitting an external seatbelt incorrectly (and therefore dangerously) around the wrong parts of your seat and powerchair. We do not just tick boxes in the regulations, we do everything we can to keep you safe if you are unfortunate enough to be involved in a road accident. To do that the design makes it very difficult to fit it wrongly by accident. 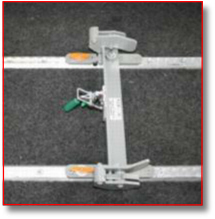 The correct points are also clearly marked so the emergency services will know how to release the system and get you to safety if necessary. Thankfully, it is very, very unlikely that you will ever have to prove how safe the docking system is. For most of the time that docking systems are used they just have to fit in with your life. 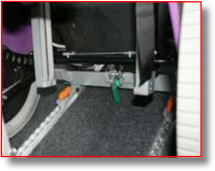 The whole docking system can "undock" and go into a bag which can be set on the back of your powerchair so you can take it with you between different vehicles, and we can work with you to decide whether you also want to have spares of certain elements so you never leave something in the wrong place.